Well, it's official. Kirstin is three months old -- today. Strange. Doesn't really seem like it's been that long, but yet it's almost difficult to recall a time when she wasn't around (even though it's not been that long). It also happens to be flag day today. I noticed it right away as I drove in to work today as I passed through Donnelly on the way. That also means it's Grandpa & Grandma Zaske's anniversary. This makes it 54 years now. Crazy. Doesn't seem like it was all that long ago when we had the big 50th anniversary bash. I had the worst hangover of my life on that morning. But it was a good day. Food (although it was fried chicken, the thought of which really just turned my stomach) helped that problem go away. There's one more day of VBS left, which is a bit of a bittersweet thing. As I noted the other day, I'm glad when it's over...but it's also kinda fun to hang around with that crew for a week. In planning for the weekend, I'm intending at this point in time to work on cleaning up the basement. At least starting the process. That will be a good project to work on, but a pain at the same time. But, if I ever intend to get that sump basin in place (and possibly an entry cut into the cistern), I have got to get this at least started (preferably completed). Ideally, I'll get the basement cleaned up (stuff organized), the sump basin done, possibly the cistern entry made, the walls cleaned, some rewiring done, the walls painted or treated, and the floor repainted/sealed. We'll see what happens there -- I also need to mow the lawn, so that's part of a day just for that project. It's been pretty humid out these last few days. I don't know how warm it's really been (in the upper 70's), but the humidity has really made being outside a bit of a miserable time. Even though I'm not really a fan of running the central air when the temperatures are about equal, the removal of the humidity makes (specifically) sleeping much more comfortable. So I had another monster picking last night. This picture illustrates that. Crazy. Anyway, I'm likely to keep this on the short order tonight; I'm particularly tired and worn out from the day. We got about a half inch of rain (just over .4" actually) today, which is good. It was still a humid and icky day in general, though (weather wise). I had something profound I was going to write about tonight, but I can't find the note I believe I wrote about it to remind me...so that's gonna have to wait for now. Ah well. In the meantime, I'll share a bit of random wisdom that I encountered this evening as I sat down to read the paper. The particular editorial I enjoyed is online here, so I encourage the read if you're looking for some good general humor. camera shake in these shots than there is. It's quite random how I came across this picture, but that doesn't really matter to most people. I randomly happened to be reading the Flickr blog and this was featured in one of the entries. So I had to photo blog it. Just totally cool. Today was fairly productive at work, but I'm totally mind-wasted when I get home after VBS. I really like doing it, but it makes for terribly long days (and I'm glad when it's over). This year is no exception. Anyway, as part of our VBS business today, we were able to go out and tour the local airport. I'd driven by there plenty of times, but never actually been on the grounds or looked around. We got to check out an airplane (small Cessna operated by the local flying club) and also the office area, etc. Very cool. 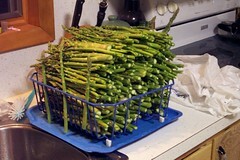 I managed to pick another full plastic grocery bag of asparagus again tonight when we got home. I'm going to wrap up this entry here (seeing as how I'm pretty tired anyway) and go wash that up along with the full bag I picked a few days ago. Then I can at least distribute some and make a bit more room in the fridge. Yay, It Worked This Time! 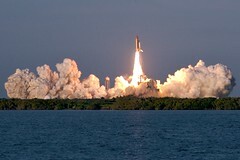 Okay, so this attempt to post my blog entry through Flickr worked again. So it must've been a fluke. That's a Good Thing. It means more photo blog entries (because it's simple). So this is going to be attempt #2 at writing a longer blog post. I've waited 24 hours since the last longer post (which for some reason didn't go through). This time, prior to hitting the 'post' button, I'm saving the text so I can always re-post if need be. Yeah. As this is the second composition, it's likely to be significantly shorter than the original, but I'll probably hit on all the topics again. In short, our weekend was pretty busy -- everything from 'kidnapping' to pseudo-camping to air conditioning to a ride in a convertible happened this weekend. And overall it was a good time. Friday afternoon Beth and Jill stopped by my office to 'kidnap' me. We made our way to Erik & Jill's house, where shortly thereafter Erik and I went to have a beer with a guy I don't know whose birthday it was on Friday. Good times. After that, we loaded up Henry's car seat in our car (along with Kirstin's), then Beth and Jill got in our car while Erik and I took the convertible on a countryside drive about 25 miles to Glacial Lakes State Park where Beth's folks were camping for the weekend. We hung around there and had some pork chops and whatnot. Started a campfire, burned up some armyworms, and just basically hung around. We left there pretty late that night (sometime around 10:30), came home, and went to bed. Got up Saturday morning after sleeping in a bit, did some outside work, then loaded up and headed back to the park around noon to spend the rest of the day. Beth, Rick, and I went on about a four mile hike on a trail through the park; that was a good time. We just basically hung out and did little, which is alright some times. We got home pretty late again on Saturday night, and then did our usual Sunday morning routine. We got invited to a bit of an afternoon gathering (for lunch and then some additional hanging around), so that's how we spent our mid afternoon. Sunday evening was littered with storms, but they were all south of us. Not a drop of rain for our place. Which is okay in a way. I officially turned on the central air conditioner Saturday before we left for the park. I knew it was going to be humid and hot, so rather than leave the house closed up (and stale), I switched the system to cooling mode. It was nice to come home to at least an un-humid house. It's been running off and on ever since (but it's been in the mid-80's to around 90 the last several days), and likely will remain that way through the better part of this week. I am definitely glad we've got it available though, because it makes for much more comfortable living quarters during the day and even at night. That and it's more efficient overall than the previous cooling method of two window air conditioners (one 7,000 BTU unit we had in our bedroom and then a 20,000 BTU unit permanently mounted in the dining room). And it's significantly quieter than either. Anyway, this is VBS week, so we've been busy with that so far. Good times -- tonight was the first night, and things went pretty well. That's a Good Thing. So it should hopefully continue that way. We get to go check out the local airport tomorrow evening, so that's gonna be cool! Seeing as how I'm not feeling up to re-writing the entire thing, I'm leaving this replacement post as a placeholder of sorts. I'll re-write bits of it, but it's not going to be tonight. Things like that make me angry sometimes, but it's not the end of the world. Ah well. Just means I get to type more later on.